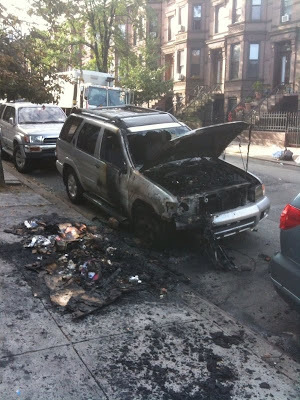 This morning, a reader sent in this photo of a burnt out SUV on 45th Street between 4th and 5th. It's one of the messier burnt out cars I've seen. More insurance troubles? Or was it a theft this time? Either way, my theory as to location has to do with subway proximity. While some people have getaway cars, others are torching their means of transportation. A man sitting on the stoop nearby told me that someone burned a mattress that was out with the trash (as a prank or on purpose?) and that the fire got out of control and set the car on fire. The mattress is what you see to the side of the car. There is a little known variant of Occams law that states, "The stupidest possible explaination is usually the correct one". I just saw a burned out minivan under the Gowanus Expressway (3rd Ave) between 45th and 46th. I don't think it was there earlier this afternoon. One car could be an accident, but two in one weekend?